Focaccia is a yeasted Italian flatbread that is soft and chewy, and it’s incredibly easy to make. There are endless variations of toppings, ranging from simple olive oil and herbs, to something slightly more complex, such as my red grape and kalamata olive with rosemary. I’ve always had it in my head that I dislike olives. I can’t recall an incident in my childhood that lead me to this conclusion, but nonetheless, I avoided them. Maybe it’s the smell? My sister made a black olive tapenade once, and thought it was a great idea to bring it along on a road trip we took together. The container it was in leaked into a bag in the backseat and I found it repulsive. She, however, found it hilarious! So when the time came to try a crostini appetizer with grapes and olives, I was tempted to pick out the olives and just eat the grapes. Instead, I gave it a try, olives and all. And guess what, I was totally into it! The sweetness of the roasted grapes balanced the brininess of the olives, and I was hooked and went back for seconds and thirds. It should come as no surprise that I’m a carbaholic. I love baking breads, pastry, cookies – you know, the good stuff. There are some types of bread that I prefer to buy, like a nice crusty french loaf or baguette, but there are others that are better homemade, like focaccia. I love making yeasted doughs, and focaccia ranks at the top because it’s so easy and the topping options are virtually endless. In the past when I would make focaccia, I would stick to herbs and roasted garlic, and use it as a vehicle for dipping in olive oil and balsamic. My current and future state of focaccia baking includes roasted red grapes and olives, a generous drizzle of good-quality olive oil, a squeeze of lemon juice and some crunchy Maldon salt. In a large bowl, whisk together flour, yeast, sugar, and salt. Pour in warm water and olive oil, and mix with a spoon until a shaggy dough is formed. Turn the dough out onto a clean work surface, and knead until a soft, smooth and elastic dough is formed - about 8-10 minutes. Transfer the dough to a lightly oiled bowl, cover with a tea towel, or plastic wrap, and set aside until doubled in size, about 1 hour. Once the dough has doubled, grease a 9x13 inch baking pan with oil and set aside. Punch down the dough and transfer to the baking pan, stretching into a rectangle to almost cover the entire bottom. Cover with a tea towel or place wrap and set the dough aside to rise for another 30 minutes or so. Once the dough has sat for the 30 minutes, press the dough to the edges of the pan using your fingertips. Make sure you create little dimples with your fingers all over the top of the dough. Arrange the olive and grape halves evenly across the top of the focaccia dough. Drizzle the dough with olive oil (I also like to use my pastry brush to ensure the olive oil is distributed evenly). Sprinkle with minced rosemary, if using. Bake for 15-20 minutes, or until golden. 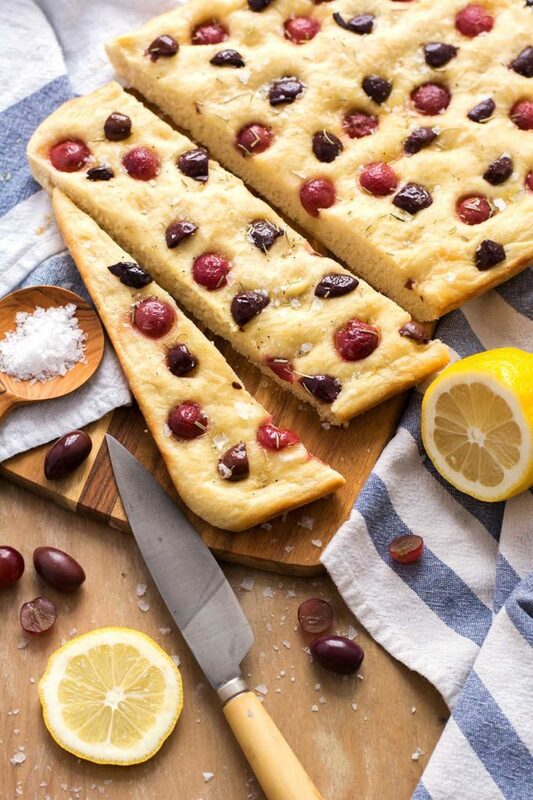 If desired, squeeze a little rest lemon juice over the top of the focaccia, and sprinkle with a little bit of malden salt - not too much though, as the olives are quite salty on their own. Once the focaccia has cooled slightly, remove from the pan and allow to cool completely on a cooling rack. Well I am a bread fanatic. This looks totally delicious…and I would eat the whole thing myself. I love making bread at home. Something so rewarding….and the aroma of baking bread….sooooo good. Like most Italians, I am a carboholic 🙂 . I love bread, pasta, focaccia, pizza, and all the baked goods. Never had a focaccia with olives AND grapes, though. Love the look of it, I’m sure it tastes great. This salty-sweet combination is drop dead gorgeous! I am seriously swooning over it. My Italian husband doesn’t always love olives as much as I do, but I think he’d enjoy it with the sweet pop from the grapes mixed in. My name is Patti and I’m a carboholic, too. I love this bread. 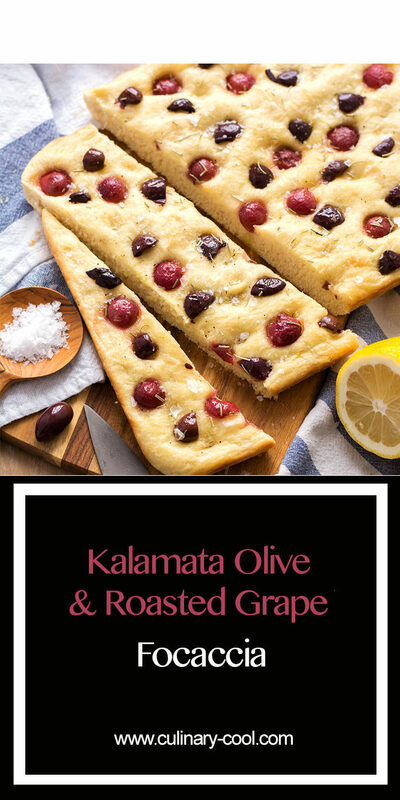 The combination of the salty olives and the sweet, roasted grapes, paired with the tartness of the lemon juice is pure genius. I’ve pinned this recipe and look forward to making this for my family. I love bread and Focaccia can be an addiction. Love olives and rosemary on mine but never tired grapes. Sounds perfect. Gotta try this soon. Sounds yum. This is beautiful, and I can see how it works. Maybe you just had bad olives, like plain black ones?!! I can really see how the combination of sweet grapes and savoury olives make this focaccia super special! It looks phenomenal with the herbs and sea salt on top! Rustic and appetizing! What a fascinating combination! I totally see the salt/sweet contrast tasting wonderful! I’ve always thought of myself as an olive hater as well, but you’ve got me sold – I would definitely try this bread! I like the idea that the grapes balance out the olives and it looks so pretty and easy to make! Such a unique bread to serve! Ok this is a combination that I never would have thought of but now I’m excited to try it! The bread is beautiful and those flakes of salt on top are perfection. Thanks for sharing! I so love a good home baked bread and this Focaccia looks absolute delicious.I will eat it up all by myself. OMG, this looks fantastic. I would have never thought to roast grapes. I bet it tastes amazing and can’t wait to try it. Focaccia is one of my all time favorite breads, but it’s never occurred to me to add grapes to it – and roasted, no less! This is so pretty, too – if would make a fantastic app on the table!